Summertime in Hood River, Oregon is a miracle of wind, sunshine, fruit, flowers – and the playground that is the Columbia River Gorge. No matter what you choose to harness the wind or ride on the water you’ll have plenty of long days to enjoy the experiences. Come evening, you’ll want to rest your head someplace that has your comfort as the highest consideration. We have camped, stayed at a wide variety of local hotels and B&B choices, but our favorite has always been the Hood River Inn (Best Western Plus) managed for over 25 years by Chuck Hinman. 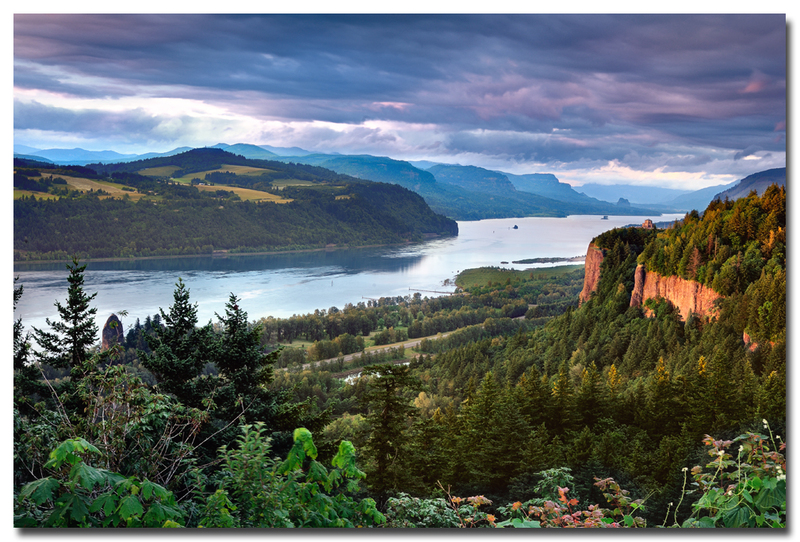 The Hood River Inn is located on the Columbia River shoreline, offering lodging with scenic river views, water access, and a private beach. We found that the Hood River Inn offers a generous combination of deluxe accommodations and amenities: (read more here). As standup paddlers, it just seems right that our first real awareness of the proximity of the Hood River Inn to the Columbia River, Hood River Waterfront Park, the Event Center and awesome Columbia Gorge views came during a standup paddle cruise from Mosier to Hood River. Our video story follows this article. When we travel, one thing we value most is absolute cleanliness in our accommodations. Once that’s covered we start looking for the details in up to date decor, inviting hallways, top-quality bedding and impeccable bathrooms. 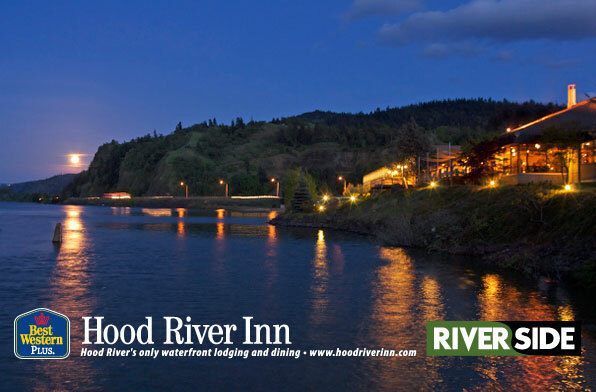 You won’t be disappointed at the Hood River Inn. After a long day on the water few things hit the spot like a hot shower – in a luxurious and well-appointed bathroom. Finish that off with a lush towel that absorbs well and exudes freshness. These things really matter to even the most hard-core water athlete. Then it’s time for food. Chef Mark DeResta’s choices of fresh and local ingredients are combined to provide a vast array of choices to suit almost any taste. Check the Riverside’s website for full details. Our experience is detailed here. If you’d like to check out the menu, here is the link. After an active day, what we really liked was the walking path that meanders from behind the Hood River Inn, around the marina and over toward the river, the spit and the event center. Without getting back in the car we could view changing colors as the sun set beyond the Columbia Gorge and foothills on the Washington side of the river. We could watch evening flights of kiteboarders and waterbirds alike. When we tired of the outdoors we could head inside for a beer, cocktail or coffee and listen to local music in Cebu Lounge. While we could enjoy food from Riverside in Cebu, the weather was so good during our stay that we had to dine outdoors every chance we could. Back in the room, Ed enjoyed watching golf and sailing on the huge flat-screen TV while I Facebooked and e-mailed a bit with the high speed wifi (free) in the room. Once it was time for sleep, comfort was waiting for us. Top quality bedding, plenty of pillows and a remote that let us alter air-conditioning without running to the unit. The best surprise was yet to come. We knew that breakfast was included with the room so in the morning we headed down for coffee expecting “the usual.” Imagine our surprise when wait staff as friendly and attentive as we had at dinner the night before greeted us with menus and offered us a wide variety of full breakfasts – at no cost. The first nine items on the menu were the options we had. Everything was served hot and promptly. The grain toast was a treat. We tried four different items during our stay and enjoyed them all. Fresh flowers, attentive and knowledgeable staff all complement the excellent, fresh food at Riverside. The view – see for yourself! Plan ahead and make reservations so you don’t miss the Hood River Inn experience when you’re in Hood River enjoying SUP fun. This entry was posted in Pacific Northwest, SUP Travel by Water Words. Bookmark the permalink.